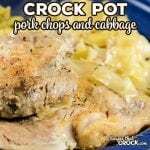 Our Crock Pot Pork Chops and Cabbage is an delicious family meal that is so simple to make with just a handful of ingredients. Place your cabbage into a 6-7 quart slow cooker. Pour broth over cabbage and place butter evenly on top. Season pork chops on both sides with steak seasoning and place on top of cabbage, layering if necessary. Cook on low for 5-6 hours or until pork chops are fork tender and cabbage has cooked through. Choosing thick chops and cutting your cabbage into thin pieces is important. The thick chops allow the pork to cook long enough for the cabbage to cook down and the small cabbage pieces will cook faster so that the pork doesn't overcook. We used our 7 quart Cuisinart to cook this up, but this dish would do well in any traditional 6 quart slow cooker or even the casserole crock.